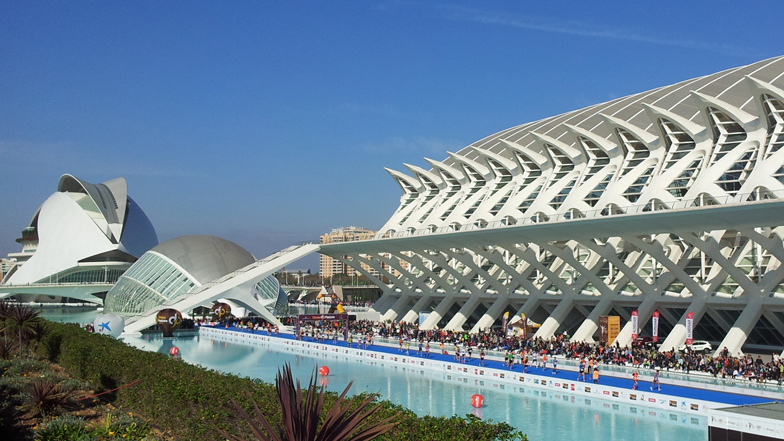 Actor George Clooney and film director Brad Bird have heaped praise on Santiago Calatrava's cultural complex in Valencia, which features as a key location in their new film Tomorrowland. In a press conference held in London this week to promote the film, Clooney described the complex as "insane". "The fun part for us is that oftentimes when you work on a film that's of a large scale, it's all just green screen and you don't really get any idea of the scope," he said. "Either we had these giant beautiful sets, or we were in Valencia in that insane building – I've never seen anything like it. It's very much a dreamer who built that." Bird, whose previous movies include The Incredibles and Mission: Impossible – Ghost Protocol, chose Calatrava's Ciudad de las Artes y las Ciencias de Valencia – also known as the City of Arts and Sciences – to form part of an imaginary ideal city. Speaking at a press conference for the film in Valencia yesterday, Bird added: "It's beautiful, very unconventional, based on natural forms but at the same time abstract." According to the film's plot, the city of Tomorrowland was created "somewhere in time and space" by French engineer Gustave Eiffel, French science fiction author Jules Verne and American inventor Thomas Edison. Clooney plays Frank, a former boy genius, who teams up with a teenager to find the city and uncover its secrets. The production team sought to create an architectural style for the city in CGI that would reflect the combined aesthetics of Eiffel, Verne and Edison. However, Bird wanted to shoot the actors performing on physical sets, and Calatrava's complex provided an outdoor location that could blend into the architectural backdrop created by the film's designers. "Calatrava's architecture is just phenomenal and inventive and exciting," Tomorrowland producer Jeffrey Chernov told the Huffington Post. "It's very skeletal, like you're looking at the vertebrae of a dinosaur or prehistoric fish. You walk into that place and you never want to leave. That's the vibe we wanted for Tomorrowland." "The architect's imagination represents that great optimistic version of life where you just go, 'I want to build that' and somebody builds it. It's pretty amazing," added Clooney. The City of Arts and Sciences was built on reclaimed land in the former port of Calatrava's home town and opened in 2005. The complex consists of a clutter of structures, including a domed cinema, a landscaped viewing point and car park, a science museum, an aquarium and a multifunctional space called the Agora. These are connected by a public plaza and bridges around a central pool. The centrepiece is a white concrete opera house with a feather-like roof and curving sides covered in ceramic mosaic tiles. In 2014, this building – the Palau de les Arts Reina Sofia – became the focus of a legal dispute between Calatrava and Valencia after sections of the roof began falling off just eight years after it was completed. Calatrava has also faced controversy over the cost of the complex, which ran to over €1 billion (£712 million) – four times the original budget. The architect was accused of "bleeding Valencia dry" after allegedly seeking €100 million (£71 million) in fees despite the overruns. Tomorrowland is released by Disney, and opens in cinemas this month.